Reclaiming the Dream: Strategize, Organize, Mobilize! 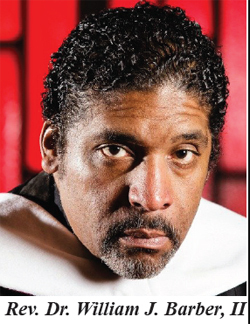 So, as the nation celebrates the life and legacy of this great American visionary leader, hundreds of social justice professionals, activists and community leaders will descend upon the city of Houston this week for the 2018 AFL-CIO Dr. Martin Luther King Jr. Civil and Human Rights Conference., January 12–15, at the Hilton Americas – Houston, 1600 Lamar St., Houston, TX. In keeping with the spirit of Dr. King, this conference celebrates his life, legacy and dream of working to improve the lives of all American citizens, as well as the lives of future generations. This year’s theme – Reclaiming the Dream: Strategize, Organize, Mobilize! – is about shifting the rules and building power so that working communities can thrive and families can enjoy the fruits of their labor, primarily because many family members, friends, loved ones and neighbors are considerably overworked, underpaid and underemployed. Going even further, far too many American citizens are living paycheck to paycheck, and barely making it from day to day. The conference workshops and plenary sessions are focused on the labor movement’s key priorities, which are raising wages, racial justice, voting rights, immigration, LGBTQ equality, criminal justice, education and a myriad of other issues affecting working families and the overall community. During the conference, attendees will explore ways in which we can better advocate for racial and economic equity, and honor those who work day-in and day-out to advance the rights of all Americans and help lift up people from poverty’s grasp. The MLK Holiday weekend presents an opportunity for the AFL-CIO to engage its affiliates, constituency groups and partners who are looking for a space to discuss the most important economic policy issues that lie at the intersection of race and class coupled with the legacy of Rev. Dr. Martin Luther King, Jr. This year’s MLK Conference will also allow for the AFL-CIO, Affiliates and Constituency Groups to optimize their collective role as a convener and leader in the economic justice space, as well as engage those who will be coming to the city of Houston for the MLK Civil and Human Rights Awards Gala and the Day of Service, both of which present additional engagement opportunities on the conference agenda. Other featured speakers include: Claude Cummings, Vice President, District 6, Communications Workers of America (CWA); Rick Levy, President, Texas AFL-CIO; Rev. 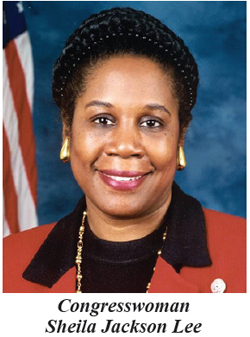 Dr. William J. Barber, II, The Forward Together Moral Movement; Mayor Sylvester Turner, City of Houston; Congresswoman Sheila Jackson Lee, 18th Congressional District of Texas; Congressman Al Green, 9th Congressional District of Texas; Congressman Gene Green, 29th Congressional District of Texas; Sylvia Garcia, Texas State Senate, District 6; Elizabeth Shuler, Secretary-Treasurer/CFO, AFL-CIO; Tefere Gebre, AFL-CIO; Fred Redmond, International Vice President United Steelworkers (USW); Robin Williams, International Vice President and Director of the Civil Rights and Community Action Department, United Food and Commercial Workers (UFCW); Maria Elena Durazo, Vice President, UNITE HERE International Union; Lee Saunders, President, American Federation of State, County and Municipal Employees (AFSCME); Lorretta Johnson, Secretary-Treasurer American Federation of Teachers (AFT); Dora Cervantes, General Secretary-Treasurer, International Association of Machinists and Aerospace Workers (IAMAW); Kenny Hansmire, Executive Director, AFCA/FBI National Child Identification Program (NCIDP); Alvina Yeh, Executive Director, Asian Pacific American Labor Alliance (APALA); Terrence L. Melvin, Secretary-Treasurer, New York State AFL-CIO; Petee Talley, Secretary-Treasurer, Ohio AFL-CIO; Vonda McDaniel, President, Central Labor Council (CLC) of Nashville and Middle Tennessee; Zeph Capo, President, Texas Gulf Coast Area Labor Federation; Teresa Mosqueda, Seattle City Councilmember; Hector E. Sanchez, Executive Director of Labor Council for Latin American Advancement (LCLLA); Rafael Navar, National Political Director, Communication Workers of America (CWA); and many more. 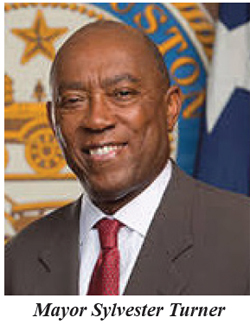 Claude Cummings, who has served as an at-large member of the Executive Board of the Communications Workers of America since 2007, is familiar with Houston and is excited to have the conference be in the city this year. 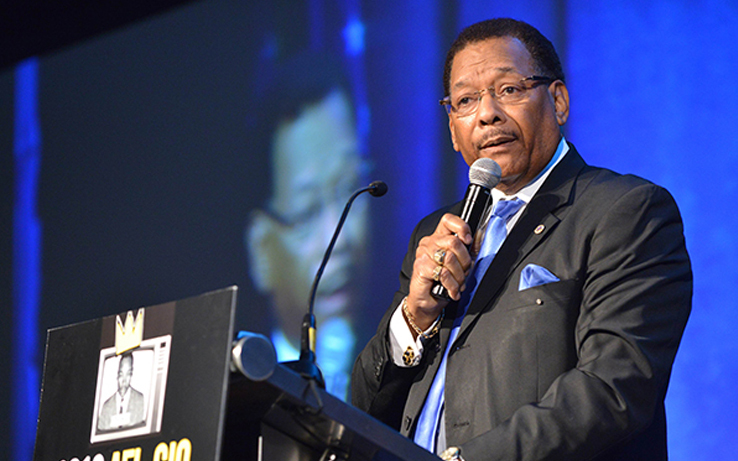 As a longtime community activist, supporting and directing civil rights efforts in the region, Cummings expressed the symbolic importance of celebrating Dr. King at this year’s conference. 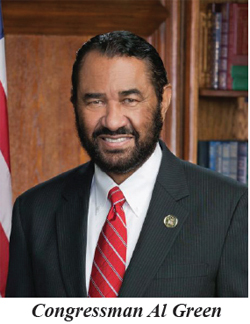 Cummings especially wants to encourage individuals in the Greater Houston area to come to the Community Town Hall on Saturday, January 13, which will be focused on how the economic fight in Texas is fully aligned with the vision and dream of Dr. King. 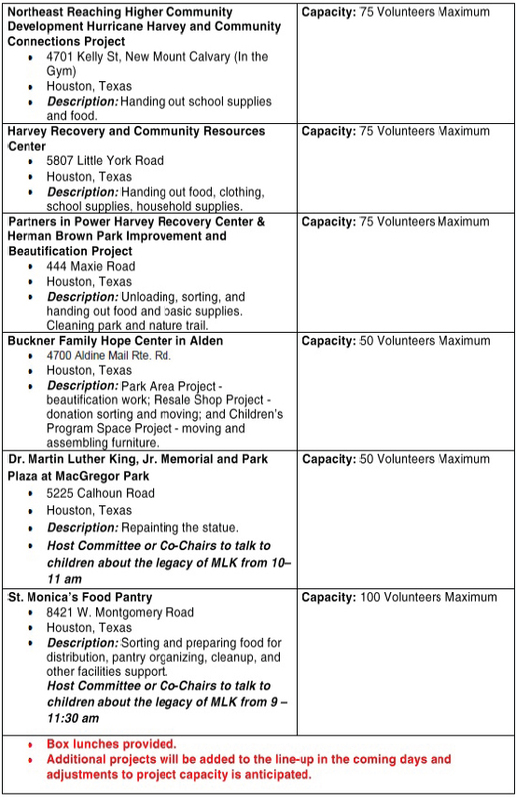 Cummings is also inviting the community out to volunteer with conference attendees at various community service projects that will be taking place all across the Greater Houston area on Saturday, January 13, as well, such as the following that are listed above. This conference should definitely be one to remember. For more information about the conference or to volunteer, please visit the website at https://mlk2018.aflcio.org/.